The immersive theater form lends itself naturally to the horror genre. Los Angeles-based productions like “Delusion” and “The Willows” are ghoulish stories made even creepier by the fact that audience members are participants in the hair-raising occurrences happening around them in real environments, rather than simply up on a stage in front of them. But what about another type of story… say, historical drama, for example? 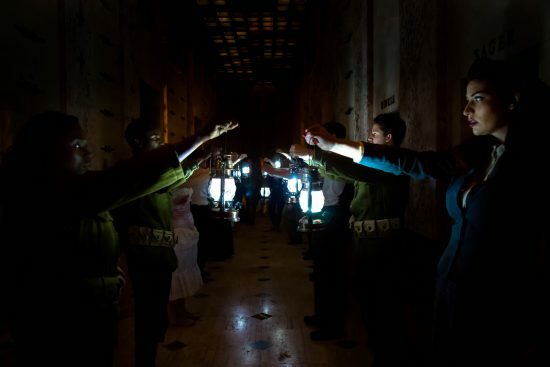 Can immersive theater be effective without being outright scary? “The Johnny Cycle” has proven that it can. 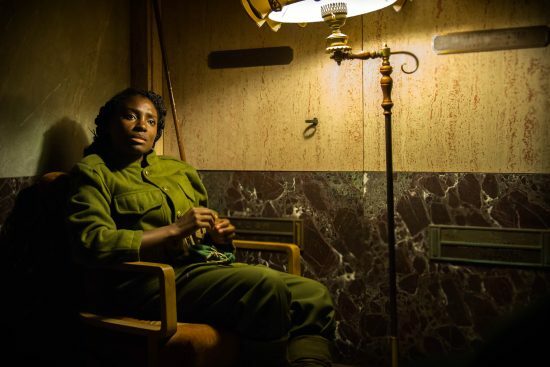 Acclaimed L.A. theater company The Speakeasy Society has spent the past few years crafting and executing an extremely ambitious three-part narrative inspired by the 1938 Dalton Trumbo anti-war novel “Johnny Got His Gun,” and by the tumultuous life of Trumbo himself. The third and final part of “The Johnny Cycle,” entitled “The Living,” is underway now at the Mountain View Mausoleum in Altadena, California, and while it is indeed the last chapter of a larger tale, it can be (and was, by me) enjoyed as its own experience. The mausoleum is a cavernous place, and has hosted other immersive works in the past, such as the excellent “Wicked Lit” at Halloween time. But “The Johnny Cycle” is something else entirely: both a retelling of Trumbo’s 1947 conflict with the House Un-American Activities Committee, and an adaptation of one of his most renowned early achievements. “Johnny Got His Gun” is a tragedy about an American soldier who loses all his limbs– not to mention his entire face– during World War I, and lives out the rest of his life on a stretcher, trapped in his own memories. The audience in the “The Johnny Cycle” takes the role of the titular Johnny (sometimes in addition to other characters) and is ushered through a series of vignettes detailing the wounded veteran’s life in the hospital, nostalgic visions of his youth pre-dismemberment, and interludes featuring Trumbo himself, juxtaposing the Red Scare trial of the author with Johnny’s post-war heartbreak and regret. It’s an evocative melding of a writer and his output, a meta-fiction in the tradition of Charlie Kaufman’s reality-bending screenplay-within-a-screenplay “Adaptation” (but far more serious-minded). 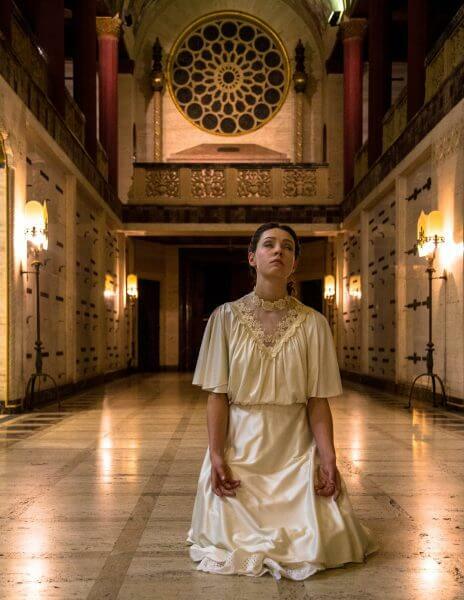 At the beginning of the performance, guests are met outside the mausoleum and instructed to behave as extras on a movie shoot– a helpful direction that establishes the audience’s role in “The Johnny Cycle,” as both observer and actor. During the course of the evening, you are frequently told where to stand and what to say. As Johnny, you are spoken with and witness to the proceedings around you, but this play is not “interactive” in the usual sense. There is very little improvisational interplay between attendee and cast member. However, you are often given lines to recite, whispered in your ear by one of the characters. At one point I was chosen to play the role of the judge in Trumbo’s HUAC interrogation, and it went a long way to help me appreciate the weightiness of the historical event in question. The cast of “The Johnny Cycle” is uniformly stellar, and I counted more than a dozen performers who help usher the audience from room to room and from scene to scene, through both fact and fantasy. Star Matthew Bamberg-Johnson is obviously quite a bit younger than Dalton Trumbo was at the time (or than the Oscar-nominated Bryan Cranston was in Jay Roach’s recent biopic, for that matter) but he gives the portrayal all the gravitas and potency it deserves. Just about each and every other member of the company also gets his or her own turn in the spotlight. There is no shortage of showstopping monologues and tense two-person argument scenes scattered throughout the show. The audience starts out in a large group of about two dozen, and as the evening moves along it gets split up into smaller subsets of eight, two, and sometimes just one, then occasionally reconvenes into a full group setting for more substantial setpieces. I was told there are three overall possible “paths” to take in this production, but enough individual scenes that one could experience the play up to eleven times without running out of new interactions to take part in. My path ended in a one-on-one scene with Johnny’s girlfriend Kareen, as she bid farewell to him (me?) before he (I?) headed off to war. I was literally the only audience member present in this moment with Colleen Pulawski– the terrific actress playing Kareen– and the resulting tenderness and intimacy reverberated far more than it could have in a traditional theatrical setting. I do have one tiny, almost-insignificant regret about “The Johnny Cycle”: the meticulously-written narrative and astonishingly choreographed staging are so effective that it almost seems a shame that directors Julianne Just and Genevieve Gearhart chose to punctuate them with several bizarrely out-of-place interpretive dance numbers. There were a few instances when I felt close to fully absorbing the significance of Trumbo’s history and its well-conveyed emotional relation to “Johnny Got His Gun,” only to be suddenly and jarringly taken out of the moment by the actors awkwardly flailing about. Immersive theater veterans may find similarities to New York City’s long-running “Then She Fell,” which similarly intersperses literary engagement with intermittent bursts of rhythmic movement, but that combination doesn’t quite jibe here. It’s the one weird misstep in an otherwise powerful presentation. 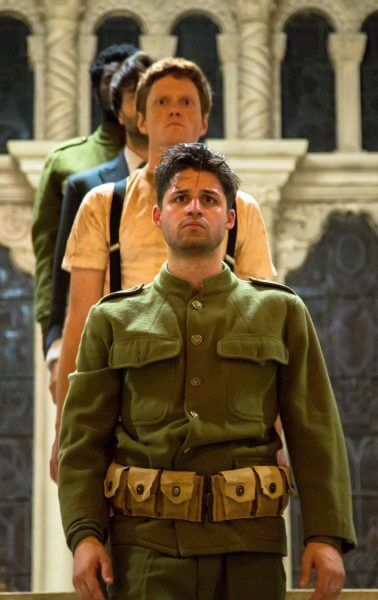 That sole misgiving aside, “The Johnny Cycle” is an undeniably memorable evening spent in with a supremely talented cast in an extraordinary location exploring the themes of belief, patriotism, and death. It’s an incredibly interesting alternative in a form flooded with horror stories, and I highly recommend checking it out. “The Johnny Cycle: Part III – The Living” is now playing at the Mountain View Mausoleum in Altadena, California. Shows run Thursday through Saturday until the end of May. Be sure to visit The Speakeasy Society’s official website and “The Johnny Cycle” ticketing page for more information. 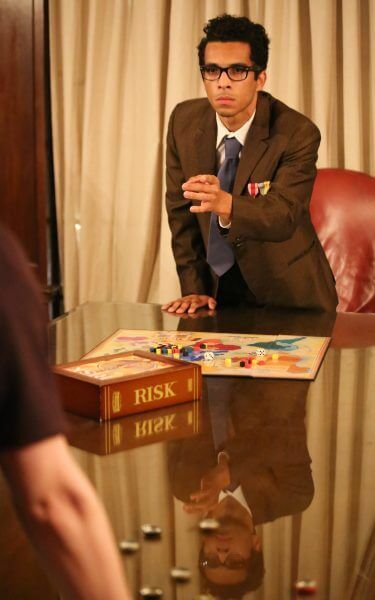 Photos by Daniel Kleen and Sara Martin for The Speakeasy Society. Hi, My name is Daniel Kleen. I’m one of the photographers that took the photo’s for the Johnny Cycle. I love ITM and I always wanted to get something on the website. It would mean the world to me and Sara Martin if we where credited for the photos! Done and done. Photo credit added at the bottom. Thanks for the great shots! Thank you so much! We love ITM and have always wanted to windup on it.